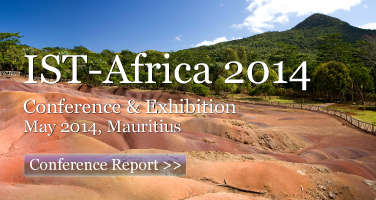 IST-Africa 2014 is technically co-sponsored by IEEE Mauritius Subsection and IEEE UK&RI Social Implications of Technology Chapter. Final papers accepted for inclusion in the Proceedings (following updates as a result of the blind peer review) will also be submitted to IEEE Xplore for publication. 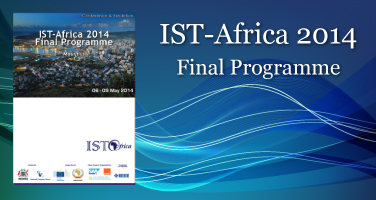 The 4th Annual IST-Africa Living Lab Thematic Working Group meeting will take place on Tuesday 06 May as a pre-conference event with other co-located multi-lateral and bi-lateral meetings taking place during the week. The Opening Plenary on Wednesday 07 May features a high level dialogue on Implementation of the Information Society in Africa. 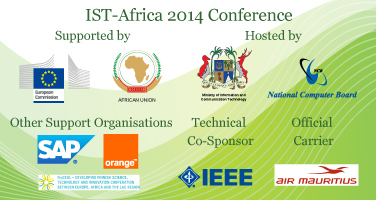 The Scientific Programme for IST-Africa 2014 is based on a double blind peer review of Papers submitted to an open Call for Papers which closed on 16 December 2013. This participatory Working Group Meeting builds on progress achieved at previous IST-Africa Living Labs Working Group Meetings (IST-Africa 2011 - establishment of EU - AUC Living Labs Taskforce for Africa, IST-Africa 2012 - establishment of new Living Labs in Tanzania, IST-Africa 2013 - introduction of Living Lab concepts in Kenya). This 4th Annual Working Group Meeting which will take place on Tuesday as a pre-conference event provides an opportunity for all key Innovation Stakeholders to (a) learn more about the potential of leveraging Living Labs methodologies for socio-economic development and (b) contribute to the establishment of a network of experts and key stakeholders committed to supporting national and cross-border Collaborative Open Innovation in Africa.